New and current UC San Diego Jacobs School Scholars are using four-year scholarships to enhance their engineering studies and careers. San Diego, CA, September 30, 2009 --Jennifer Fang learned her first programming language, Visual Basic, in the third grade. Since then she has honed her programming skills and is entering UC San Diego’s Jacobs School of Engineering this fall as a freshman computer science major, with an emphasis on bioinformatics. Fang has an extra bonus during her time at UC San Diego – through the Jacobs School Scholars program, she will have her full tuition plus room and board paid for over the next four years. The Jacobs School Undergraduate Scholar program selects students for their outstanding academic achievement, extraordinary leadership and commitment to their community. The Jacobs School Scholars program – the highest award the Jacobs School can bestow upon a student – was established in 2000 through a generous gift from former Jacobs School professor and Qualcomm co-founder Irwin Jacobs and his wife Joan. Although the most competitive high school students apply to UCSD, many ultimately choose to attend other universities because they are offered more appealing financial incentives. Through the Jacobs Scholars program, the Jacobs School can offer more competitive financial packages and attract and enroll the most promising future engineers. Besides Fang, other Jacobs Scholars this year are Michael Adsit (aerospace engineering), Alex Chan (electrical engineering), Thomas Chew, (chemical engineering), Linda Ding (bioengineering), Benjamin Ellis (computer science), Nicole Lim (bioengineering) and Philip Loury (bioengineering). Fang said being a Jacobs Scholar will provide her with the skills necessary to succeed as an engineer. Jacobs Scholar Nicole Lim hopes to make a difference in the growing field of bioengineering. Nicole Lim also hopes to make a contribution to her field and to society. “I only know that I want to give back to engineering what the Jacobs School of Engineering has given to me through the Jacobs Scholars program,” said Lim, who came to UCSD from Coto de Caza, Calif. “From the start of my college application process, I've always known that UCSD's biology-related programs were very strong and very highly ranked, which is why I chose bioengineering as my major when I applied. Of course, I always want to try and learn from the best. Philip (PJ) Loury, who graduated valedictorian from Lynbrook High School in San Jose, Calif., was inspired to become an engineer through the UCSD California State Summer School for Mathematics and Science (COSMOS) last summer. 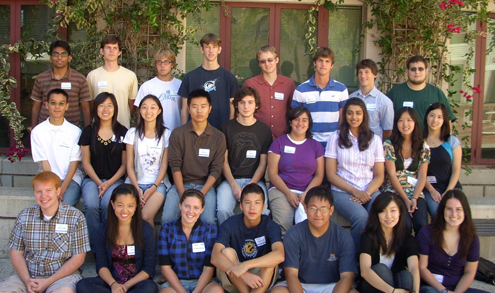 COSMOS is a four-week residential summer program open to high school students who have demonstrated interest and achievement in math and science. Loury said the Jacobs Scholar program will provide him with the unique opportunity to work with and learn from experts at the forefront of the biotech industry, while also giving him access to research and internship opportunities. “This summer I had an amazing experience as a research and development intern at a biomedical device start-up,” he said. “I hope to continue to do research as an undergrad, and my goal is to translate my familiarity in the lab into a job opportunity after college. Being a Jacobs Scholar will put me on the fast track towards my dream career as a leader in the Biotech industry. “I hope to contribute to advances in biotechnology that will lend themselves to more novel approaches to medicine in order to better confront difficult to treat afflictions like cancer, genetic disorders, and degenerative diseases,” Loury added. Alex Chan, whose father was an electrical engineer, said it was natural for him to choose that field of engineering. The Del Mar native, who graduated from Torrey Pines High School, said the Jacobs School’s Teams in Engineering Services (TIES) program also hooked him on UCSD and on an engineering career. Under the TIES program, multi-disciplinary teams of UCSD students design, build and deploy projects that solve technology-based problems for community partners.